La Purísima Concepcion Catholic School History On December 8, 1956, two Sisters of Nazareth left Paris, France for the long journey to Lompoc to aid in the establishment of the parish's elementary school - La Purísima. The Sisters interrupted their voyage with a pilgrimage to the shrine of the Immaculate Conception at Rue du Bac and then after a stormy passage on the Atlantic, arrived in New York City. The hearty welcome received in Lompoc made them feel at home right away. On December 15, two corner stones of what would become the La Purísima Convent were in place.The Sisters busied themselves teaching Catechism classes while watching the new school being built. In addition, they became acquainted with their new environment and worked to meet the California teaching requirements. 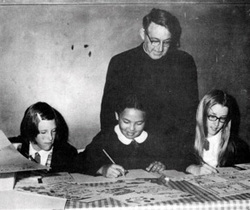 In May, 1957, a third Sister joined the original Teacher and by September, 1957 the school was ready to start with five grades, three Sisters and two lay Teacher forming the staff.Each year ensuing, the staff was enlarged by another Sister of Nazareth and a third lay Classroom Teacher was added. 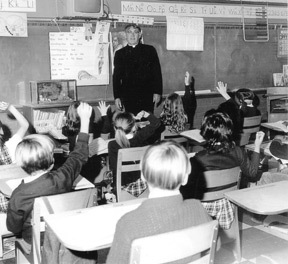 In September of 1959, the school was filled to capacity with 400 students in eight classrooms. In June, 1960, the Parish was proud to enjoy the first graduation from La Purísima School.